How many of you have thought of climbing Mount Kilimanjaro during your honeymoon? Winter is the time of year when people want to knuckle down and stay in their warm and comfortable homes, cooking dinners with their family and binge-watching their favorite shows. This is the season for engagements, not weddings, and certainly not honeymoons. However, newlyweds will be missing out if they didn’t consider a winter getaway. Summer is not the best time to travel because fewer discounts are available, huge crowds put a damper on the vacation, and temperatures are uncomfortably hot even in destinations where snow and cold weather are not a concern. 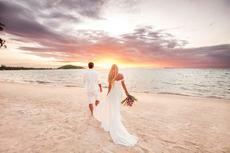 Just like weddings in the winter (off-season) are cheaper, honeymoons are, too. Go to a tropical destination where you’ll be spoiled with an endless list of exciting recreation activities and find romantic adventures at secluded shores you don’t know about; discover together lesser-known treasures such as hot springs, lively cities and volcanoes to climb; or camp under the stars in a huge expanse of a national park. From deep diving in Oman to hiking through the woodlands, keep in mind that some of the most exhilaratingly romantic post-wedding destinations in the world are probably best visited when friends and family back home are shoveling snow and writing down New Year’s resolutions. How many of you have thought of climbing Mount Kilimanjaro during your honeymoon? You may be surprised to know that some couples even choose to say “I do” at the top. Many under the radar destinations boast lively biking, hiking or diving cultures because of diverse geography and wildlife.